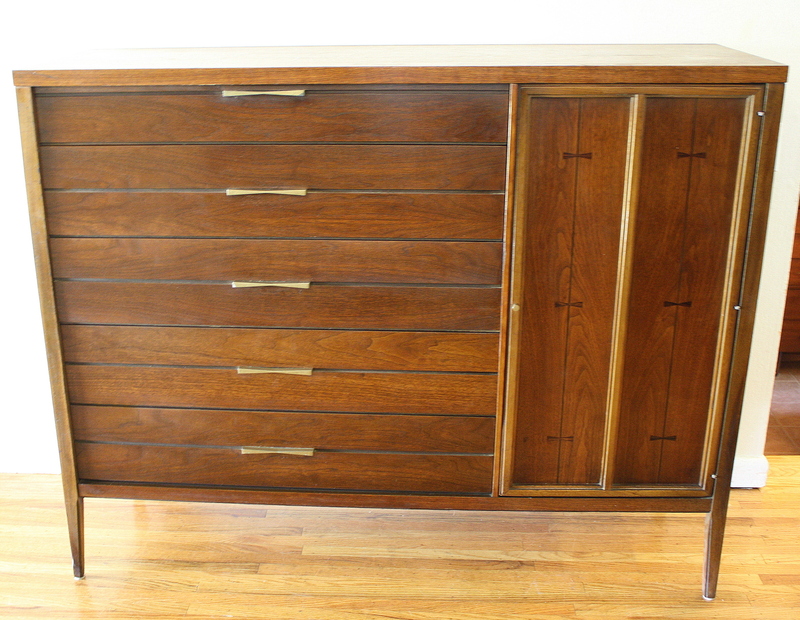 This is a mid century modern bachelor chest dresser from the Lane Acclaim series. It has their signature dovetailed design in the front, 3 dovetailed drawers with undulating silver pulls, and tapered legs. Dimensions: 34”W x 17”D x 30”H. 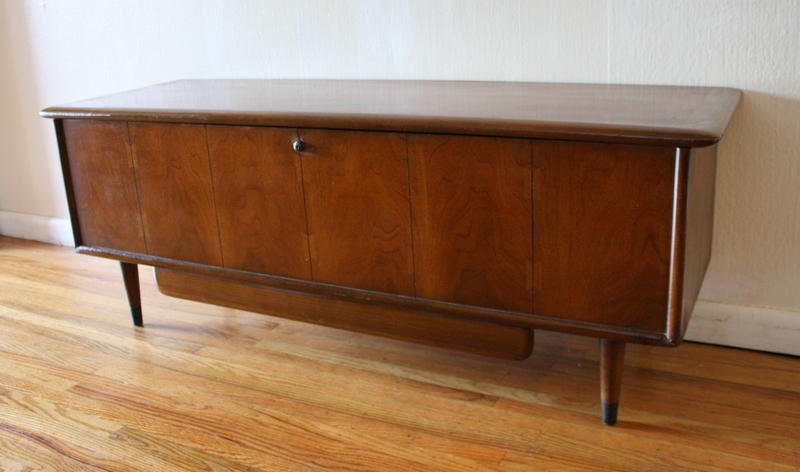 This is a mid century modern cedar chest trunk from the Lane Acclaim series. It has the signature dovetailed design on top, faux drawer front, tapered legs, and 1 bottom valet drawer. Dimensions: 45”W x 17.5”D x 23.5″H. This is a mid century modern console table from the Lane Acclaim series. It has their signature dovetailed design, 1 dovetailed drawer with brass handles, and tapered legs. Dimensions: 46″W x 17″D x 26″H. These are 2 pairs of side end tables from the Lane Acclaim Series designed by Andres Bus. Bot sets have their signature dovetailed design, bottom shelves, and tapered legs. Dimensions of pair of square side end tables: 23″W x 23″D x 21″H. Dimensions of rectangle tables: 28″W x 21″D x 20″H. This is a pair of 2 tiered side end tables from the Lane Acclaim Series designed by Andres Bus. The tables have their signature dovetailed design and tapered legs. Dimensions of pair of 2 tiered side end tables: 20.5″W x 28″D x 20.5″H. 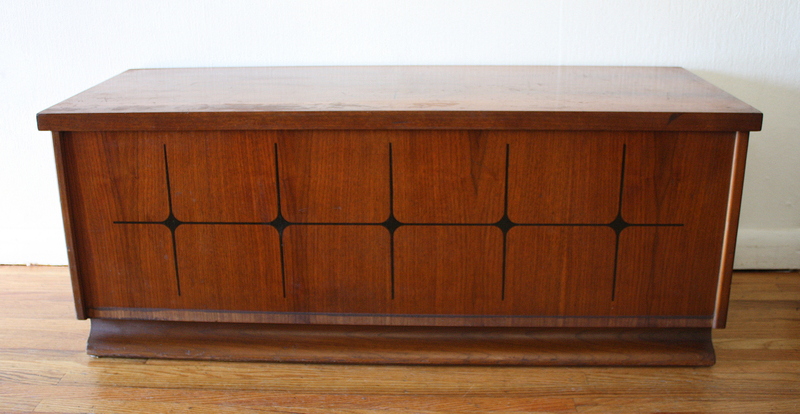 This is a mid century modern record cabinet from the Lane Acclaim collection. It has its signature dovetailed design, a flip front that displays and stores records, and tapered legs. Dimensions: 28″W x 15″D x 28″H. These are 2 mid century modern record cabinets. The first is by Lane, has their signature dovetail design, record slot storage, and tapered legs. Dimensions: 30″W x 18″D x 22″H. The second is a record cabinet with open slot storage, and a top shelf. Dimensions: 30″W x 16″D x 26.5″H. Both record cabinets are sold. This is a mid century modern coffee table from the Lane Acclaim collection, designed by Andre Bus. It has their signature dovetailed design and tapered legs: 30.5″W x 30.5″D x 14″H. 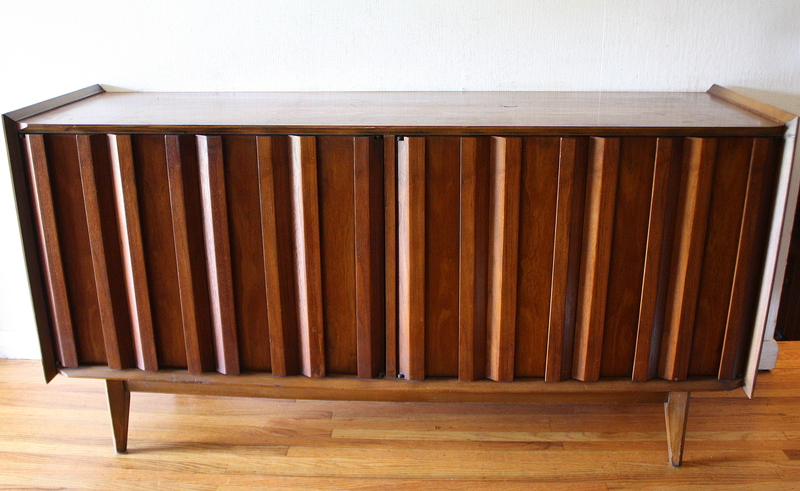 This is a mid century modern credenza by Lane. It has a beautiful vertical slat design incorporated into the cabinet door handles. There are 2 cabinets, the left has 1 dovetailed drawer, the right has an adjustable shelf. Dimensions: 60″W x 18″D x 30″H. 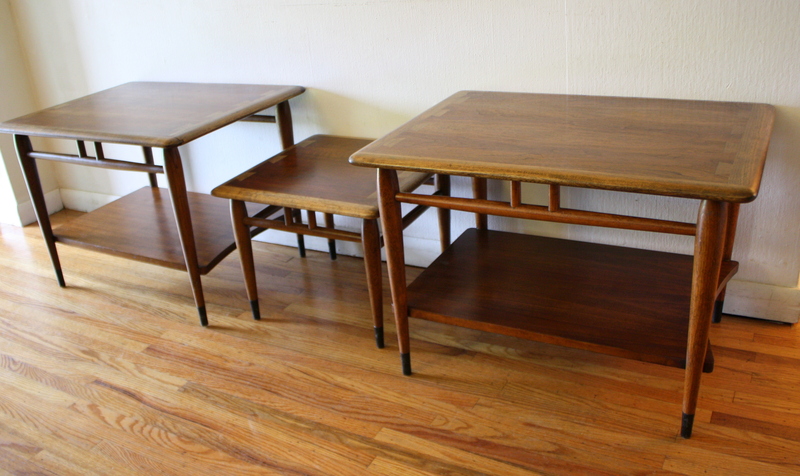 These are 3 mid century modern side end tables from the Lane Acclaim collection designed by Andre Bus. The tables have the signature dovetail design and tapered legs. The matching pair of side tables have a bottom shelf. Dimensions of the larger side tables: 21″W x 28″D x 20″H. These are 2 mid century modern cedar chest trunks by Lane. The first is from the Lane Acclaim collection. It has its signature dovetail design on the top of the trunk and front. It also features a valet drawer below. Dimensions: 53″W x 17″D x 19.5″H. The second trunk has a great atomic design and curved base: 43″W x 16.5″D x 17″H. Both Lane cedar chest trunks are sold. This is a selection of mid century modern side table nightstands. The first is a demilune table from the Kent Coffey Perspecta line. It has the signature arched design, drawer and cabinet: 25″W x 17″D x 25″H. The second is table is by Lane, has beautiful angles, 1 dovetailed drawer incorporated into the design, and tapered legs: 29″D x 21″W x 21″H. The third table is from the Lane Acclaim series. 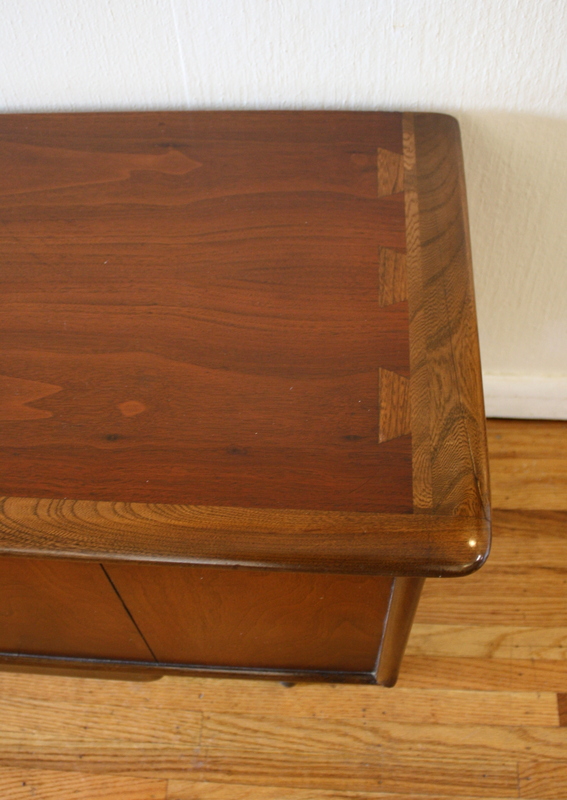 It is a square side table that has its signature dovetailed design, tapered legs, and lower shelf: 23″W x 23″D x 21″H. All 3 tables are sold. This is a mid century modern armoire and low dresser credenza from the Lane Tuxedo line. These pieces are made of walnut, rosewood, and ebony. They have the signature bowtie dovetails and matching brass handles. The armoire has 5 dovetailed drawers and 1 side cabinet with 4 shelves: 56″W x 18″D x 44.5″H. It has the dovetails on the top and on the side cabinet door. The low dresser credenza has 6 dovetailed drawers with the dovetails on top: 58″W x 18″D x 30″H. 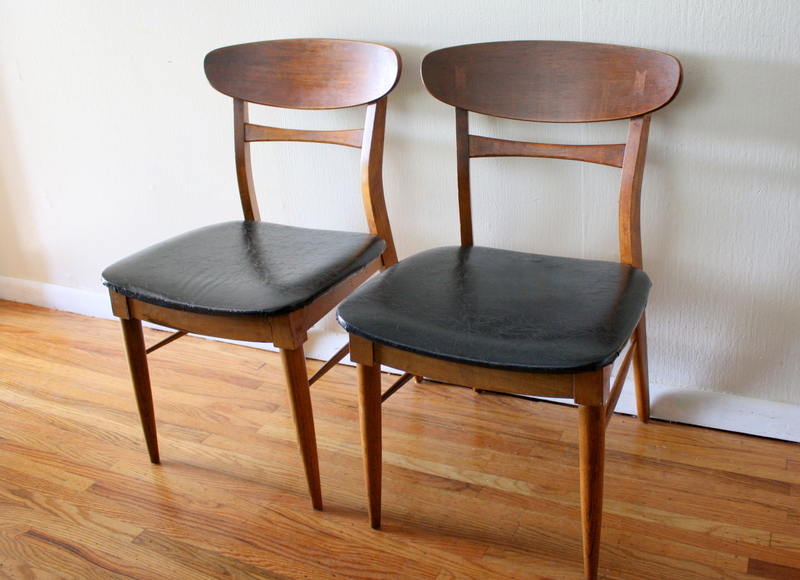 This is a pair of mid century modern side chairs by Lane. They have their signature dovetail design in the seat backs, are made of solid wood, have upholstered seats and tapered legs. Dimensions: seat width: 18.5″, seat depth: 18″, seat height: 16.5″, back height: 32″. 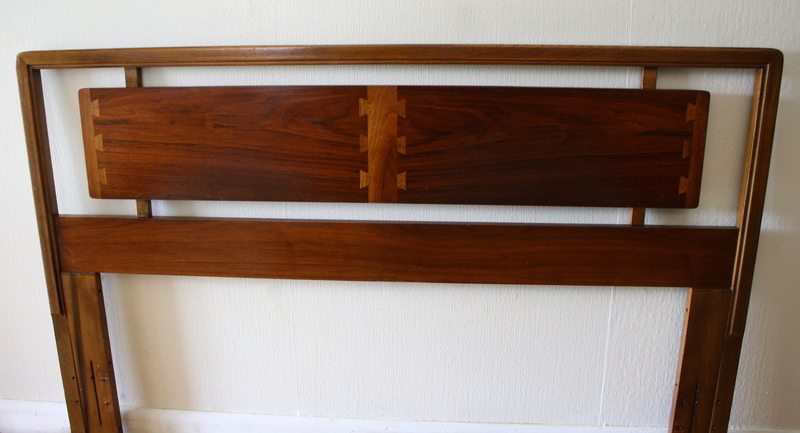 This is a mid century modern headboard from the Lane Acclaim series. It is made of solid wood and has the signature dovetails. Dimensions: 60″W. 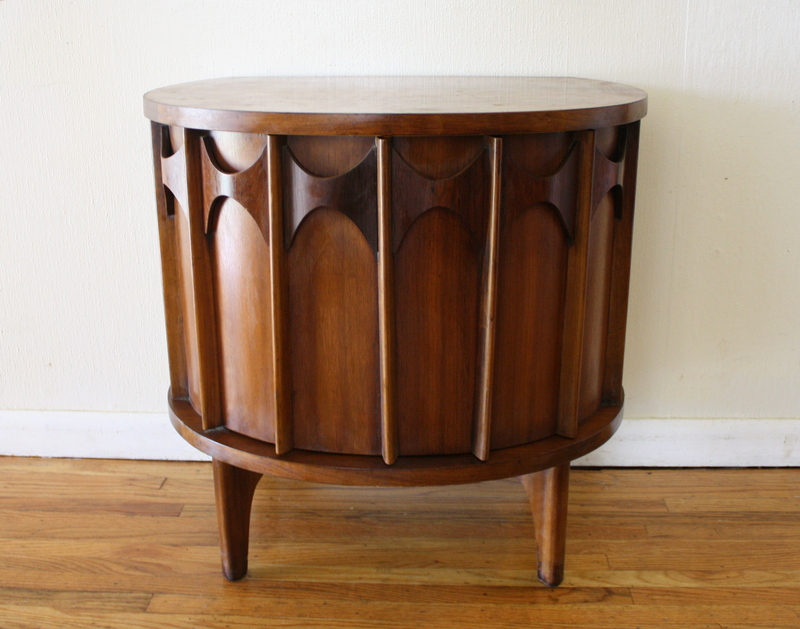 This is a mid century modern round coffee table from the Lane Acclaim series. It has the signature dovetailed design and tapered legs. Dimensions: 36″ diameter x 14″H. 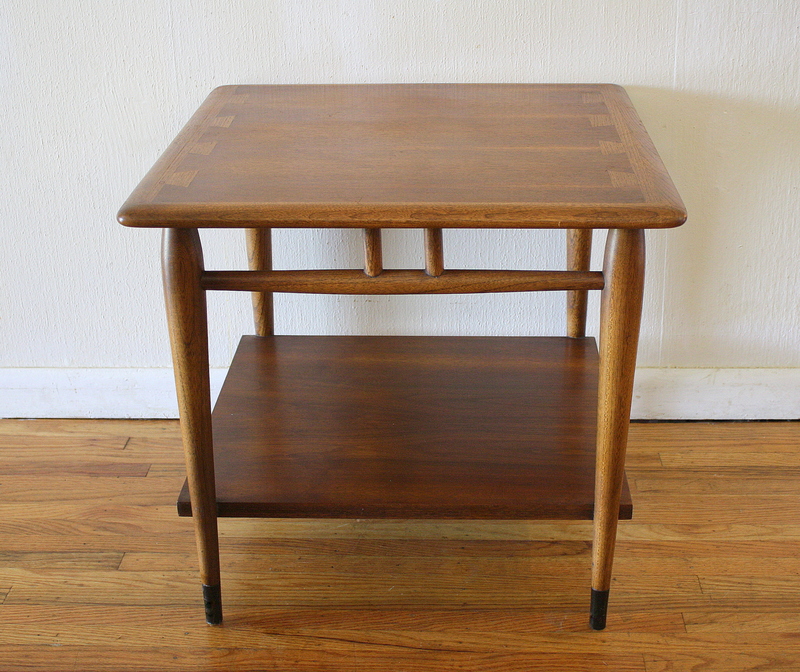 This is a mid century modern table from the Lane Acclaim collection. It has the signature dovetail design on top, a dovetailed drawer with brass handle, and tapered legs. Dimensions: 28″W x 28″D x 20″H. These are 2 Lane Acclaim dovetail accented tables. The first is a round coffee table. It has the beautiful signature dovetail detailed construction and tapered legs. Dimensions: 38″dia x 14.5″H. The second table is a dovetail dining table with 2 leaves. 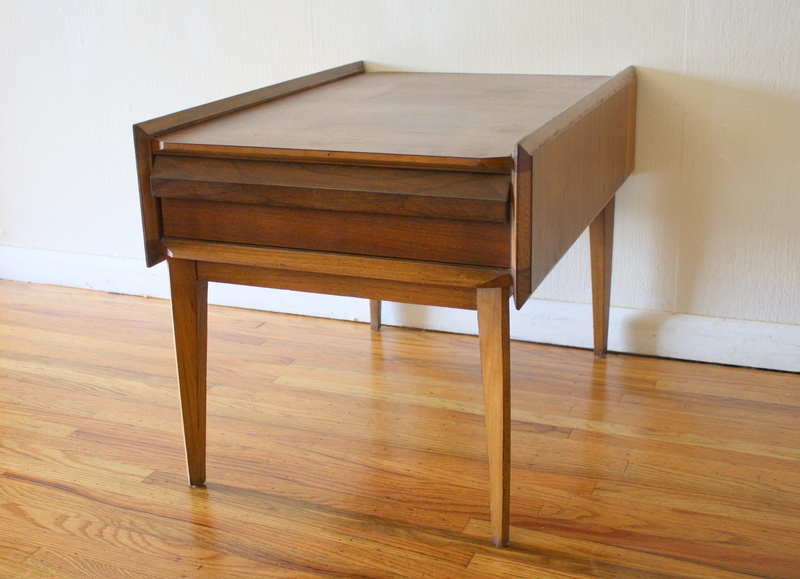 This is a mid century modern coffee table by Lane. It is from the “Acclaim” series by Andre Bus. 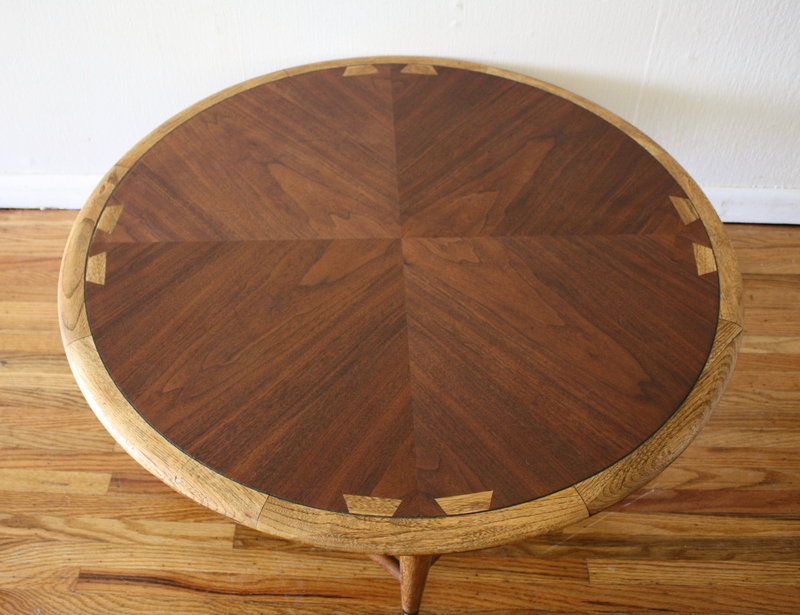 The table is in excellent condition and made of solid wood. It has the very cool dovetail design on the top and tapered legs. 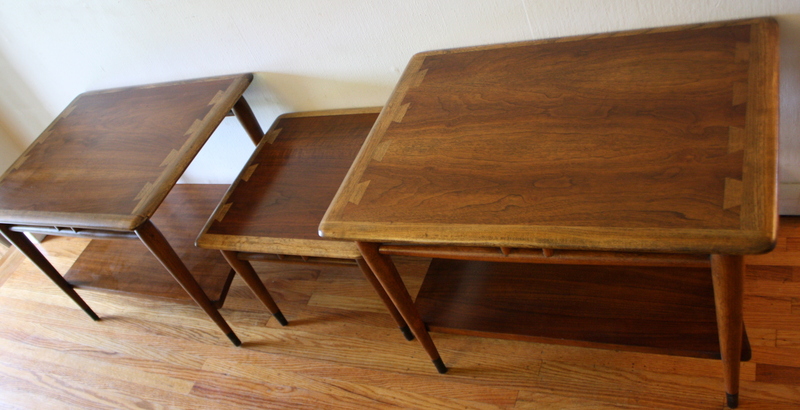 These are two sets mid century modern modern side end tables by LANE. They are solid wood and are from the Acclaim Series. Available is a pair of rectangular dovetail side tables with a lower shelf and a pair of two tiered dovetail side tables. They have the unique dovetail joint design, and signature tapered legs. 1 Pair of two tier dovetail side tables is sold. Pair of rectangle side tables sold in a Picked Vintage sale featured on Fab.com. This is a pair of side end tables by Lane. It is from the Acclaim series by Andre Bus. The tables are made of solid wood, have the signature dovetail design, a bottom shelf, and tapered legs.